Happy Hump Day everyone! Today’s page was a unique challenge as it was one of the busiest pages I’ve ever had to ink. 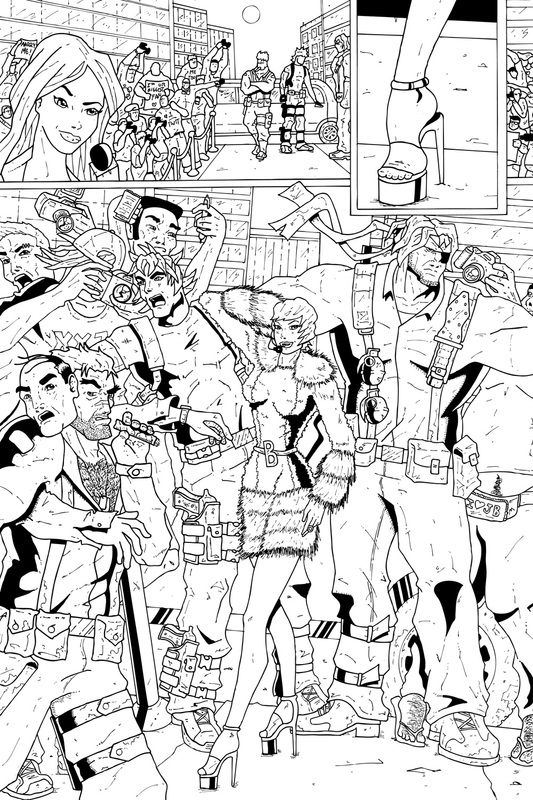 Having all of the crowds, plus Team Stryker, plus buildings in the background made inking tough. I had to make sure that everything ran together without blending into one another. It can be very easy to have details, and even characters get lost in all the chaos. My favorite part is getting to make sure details like the paparazzi’s belly and feet hair make the transition from pencil to ink. When you’re inking there are so many places to start that you can over look things or not finish them all the way through. Several times I’ll be coloring in a black spot, get distracted and forget where I left off. Luckily I usually catch them before the page goes off to be colored. Enjoy your new comics day and I’ll see you back here for the explosive pencils to Mission 004 Page 04!